The WSJ had a cute story today about clinging to the past in the face of modern technology and its inability to digitally represent the volume of your influence. Thus, the Rolodex is the thing to keep on your desk if you need everyone to know how many other people you know. Multiple business cards + unusable desk space + a penchant for being a Luddite = priceless business acumen and POWER!! 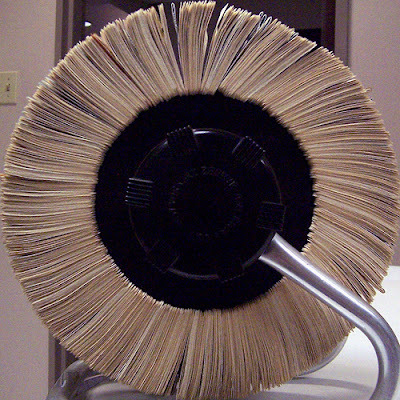 For Rolodex loyalists, though, part of the card system's appeal has always been that it displays the size of one's business network for the world to see. Someone's Rolodex is "a reminder to themselves and an announcement to others about who they are and what they have achieved," says Joel Podolny, dean of the Yale School of Management and the author of the 2005 book "Status Signals." Two computer monitors, two telephones and a BlackBerry sit in the office of Jose W. Fernandez, a 52-year-old partner of law firm Latham & Watkins. Floor-to-ceiling windows reveal sprawling views of Manhattan, and the walls are adorned with Latin American art. But when clients and colleagues stop by his office, Mr. Fernandez says, "The only thing people notice is that I still have a Rolodex."